Marvel Vs. Capcom 2 returns! Thread: Marvel Vs. Capcom 2 returns! There will be an exclusive PSN demo on the 30th for those who want to try it before buying. 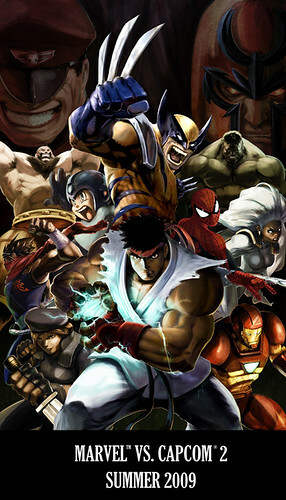 Marvel Vs. Capcom 2, which arrives this summer on both platforms, will cost $15 USD. Considering the game costs upwards of $80 on the PS2 and this new version features online play as well as an enhanced visual filter and widescreen support, that's an incredible bargain. and others, such as a SF game for the Wii, but you have to import. It was also an Arcade game. Looks schweet though, although a PSN exclusive demo is kinda ghey... its a freaking demo. Ah, great news. About time they release this game again - it was an amazing title. I had a chance to play the UFC demo last night. Man, oh man ... I am shocked how good this title is going to be. I was paranoid it would be the old school UFC/Dreamcast game with a graphic overhaul. They managed to make an actual MMA game that is fun to play and has a ton of moves. I'll be adding UFC to my list of 2009 fighting games along with Fight Night Round 4, SF IV, Tekken, etc. Nice! I'll be picking this up asap.....I love the PSN, thank God they realized that Nintendo had a brilliant idea in rehashing the classics. Kinda off topic, but dcikra do you have a PSP? If you do, you HAVE to check out the ultimate ghosts 'n goblins in the PSN store. Only 15 bucks and it's by FAR one of the most fun games I've ever played. They took the old school ones, (Super G&G, etc), and added all new graphics that look almost ps2 quality, made it much easier, and it's got more replay value than most games I've seen in a while. While i thought UFC was decent at first, I realized there is a long list of complicated moves. I still think it's decent, but obviously someone who has mastery of these moves will destroy you. I only completed half the training, which was basically perfect using The Iceman. I just need to figure out how to get out of submissions and escape stuff like that. Otherwise, it's pretty dope. $15, thats pretty cheap. I'll look into this when one of you comments how it is on the 360. No, I never picked up a PSP... I've been close several times but it just never felt right. Plus I can't play it while in a car/etc because it made me mad nauseous. So that took a lot of usefulness out of it for me too lol. btw, congrats on college graduation. I loved this game, absolutely LOVED it! Totally grabbing the demo on the 30th! Oh, I'll absolutely be getting this. Inside sources say you'll be able to jump, duck, punch, kick and use a power!